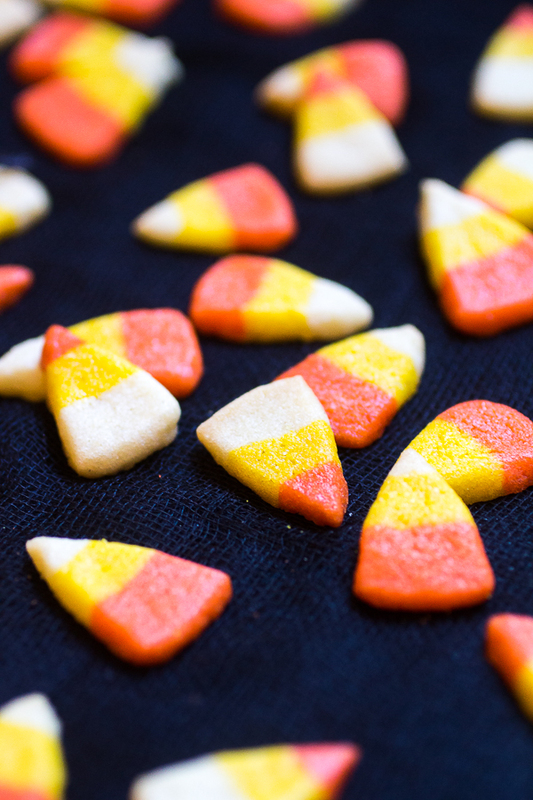 Embarrassing memory aside, there are 2 reasons why I’m obsessed with this holiday: creativity and candy. I’m always so amazed by how creative people are this time of year. 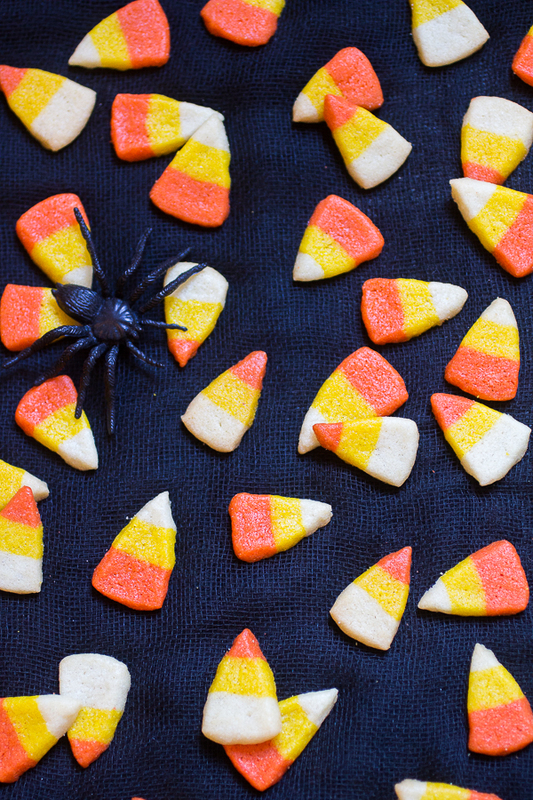 Whether it’s perfectly executed costumes, or crafty as heck decorations, people are constantly coming up with ideas that make me both super jealous, and super impressed. And then there’s the candy. I LOVE CANDY. Some people call it a sweet tooth. No. All of my teeth are sweet teeth. It’s a problem. I discovered these cookies when I was recipe testing at my new job at Taste Buds Kitchen. I’ve been there for about a month now and so far it’s been great. We teach cooking classes for kids during the day and adult byob classes at night. 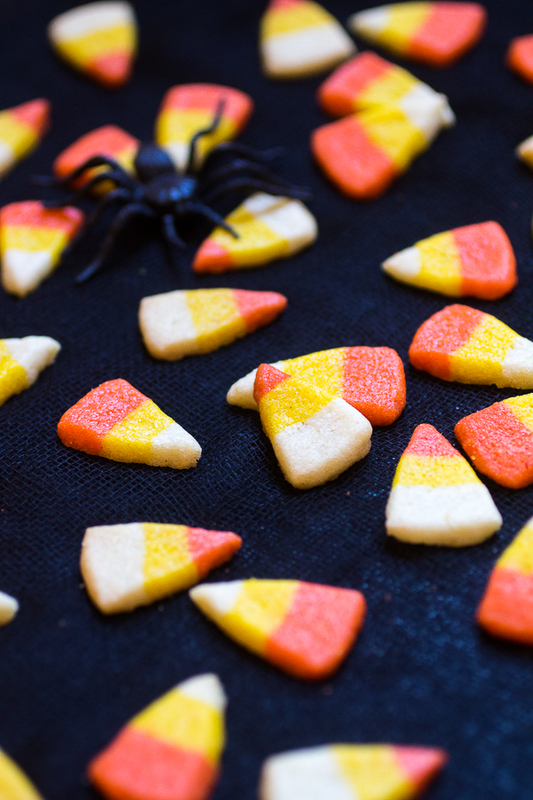 They are always designing fun new classes and recipes for kids and adults, so I’m hoping this means a cookie decorating class is in the works…fingers crossed! Mix the flour, baking powder and baking soda in a separate bowl. Set aside. Cream the butter and sugar until light and fluffy. (about 5 minutes with a hand mixer, and 2-3 with a stand mixer). Add the egg and vanilla and mix for about 2 minutes. Add the dry ingredients in 3 increments. Divide the dough into three equal bowls. (I weighed the entire batch, and then divided it to make sure there was a perfectly even amount of each color). Add about a teaspoon of food coloring to two each batch, leaving one plain. Mix until the color is completely incorporated. 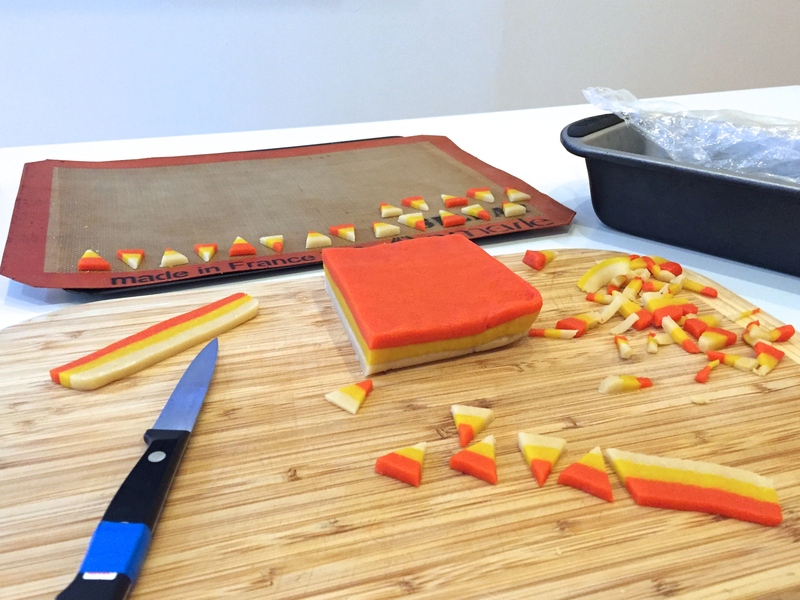 Wrap each color separately in plastic wrap and refrigerate for about an hour. Remove the cookie dough from the refrigerator for about 5 minutes before using. 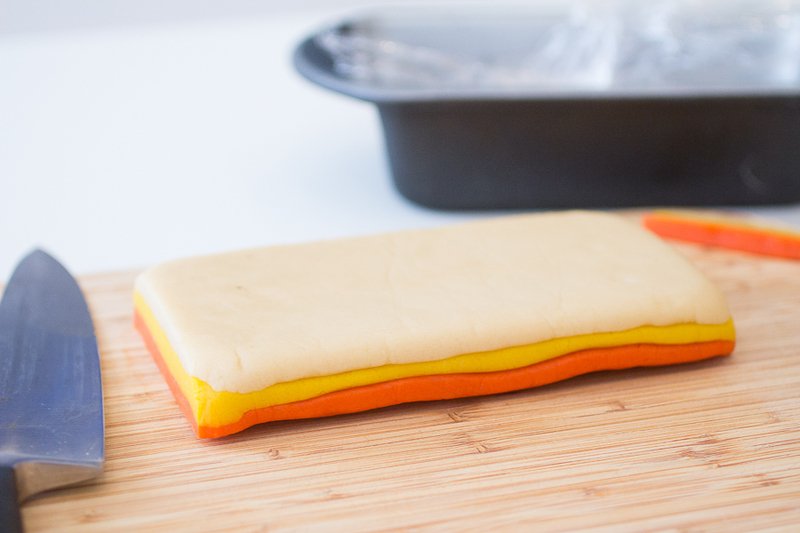 Roll out the orange dough into a log roughly the length of your pan. Using the palms of your hands (or a rolling pin) shape the dough into a rectangle, and place in the bottom of your loaf pan lined in plastic wrap. Repeat this process with the remaining two colors, being sure to make the rectangle as precise as possible before trying to fit it in pan. Press down lightly with your palms so the colors stick together. Wrap and refrigerate for 30 minutes. Turn out the cookie loaf on a cutting board. Slice four ¼'' slices and return the dough to the fridge or freezer while you work. The dough is easier to work with cold. 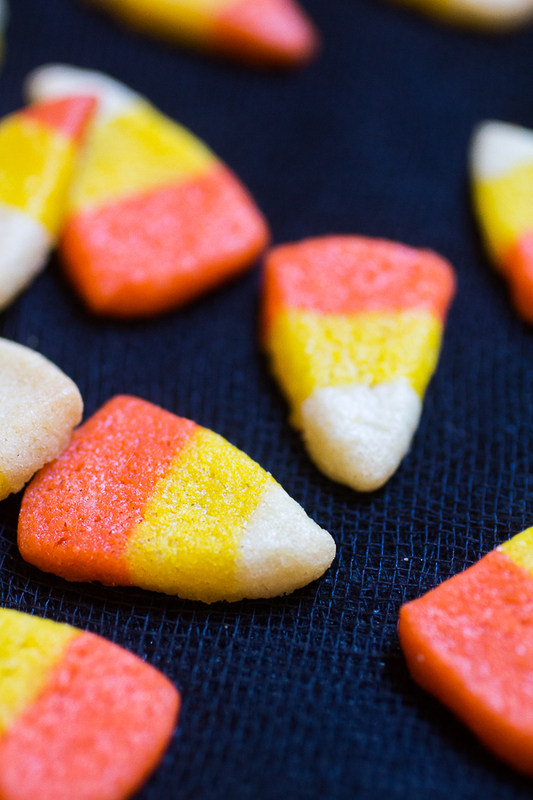 Cut each slice in a zig-zag pattern, and place the cookies about 1 inch apart on a non stick cookie sheet. Place the cookie sheet in the freezer for about 5 minutes. Bake for 3 minutes, rotate, and bake for 4 more. Let the cookies cool on the sheet completely to finish baking (this prevents them from getting brown on the edges). Repeat with the remaining dough.